Working Letterpress Museum Print Shop. Printing “projects of interest”. 500 cases foundry type, Ludlow with 40 cases of mats. Many castings and engravings. Vandercooks, Pilot, Pearl, Gordon, C&P, Colt, Heidelberg Windmill; Kelsey & other table-top presses in use, restored and on display. Posters, cards, tickets, invitations. 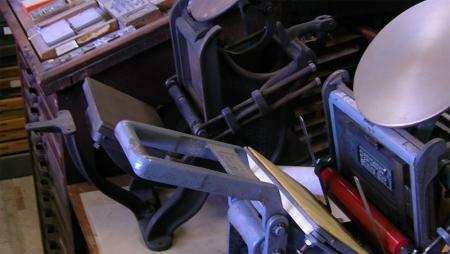 Printing, die-cutting, embossing..
Letterpress training workshops privately scheduled. Inventors/producers of The Excelsior Chase-Base (replaces chase) designed to maximize plate image area for Photo-polymer plates on table top presses. The comment box is meant for constructive feedback. See the contact link for more information on how to contact a listing owner. Alan: Just looked it up. The platen press I referred to in an earlier post was built between 1850-1890.